BIRMINGHAM, AL – The “10th Annual Father’s Day Iron Dad Competition,” set to take place on Sunday, was cancelled at the last minute Friday, when it appeared that there was only one father fit enough to take on the challenge. Barry “Buff” Harrington was disappointed at the news, saying he had been training for the Iron Dad Competition for the better part of this past year and felt sure to take home the top prize of a Sears top-of-the line treadmill. 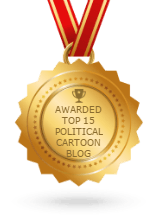 “You have to be kidding me,” said an irate Harrington when told the news. The race, consisting of 10 minutes running, 15 minutes swimming, and 30 minutes bicycling, far less than a normal endurance competition, had only seven entrants this year, down from 23 last year. Out of that, only Buff qualified. The Birmingham Chamber of Commerce convened immediately following the decision to determine what, if anything, they could plan on such short notice to still help fathers and their sons celebrate Father’s Day together. It was announced late Friday evening that the Chamber would host a Father/Son Eating Competition instead. Re-named the “1st Annual Father’s Day Pig Out Competition,” it would roughly follow Triathlon guidelines of three eating competitions, namely, Hot Dogs, Ribs and Hot Wings. As of Saturday afternoon 74 father/son teams had signed up for the competition, and ironically, all but Buff qualified. 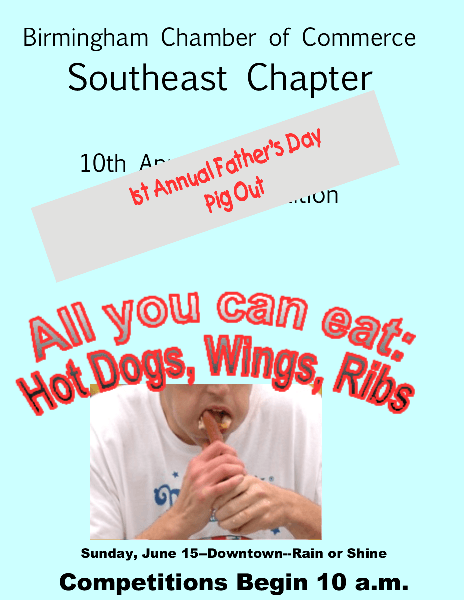 The Birmingham CoC 1st Annual Father’s Day Pig Out Competition will begin Sunday at 10 a.m. and is expected to last until the food runs out, which is anticipated to be sometime around 11 a.m. Those wishing to participate are asked to bring their own bibs. When asked for further comment, Buff walked off in a huff.